If you are interested in becoming a commercial pilot, then the Career Pilot degree is for you. This could mean flying for an airline or a private corporation or flying for the military or a government agency. This degree does require flight training and is focused on providing you with a fundamental knowledge of flight concepts, aerodynamics, meteorology, aircraft systems, airline operations, flight safety practices, and human factors. In order to graduate with the Career Pilot degree, you must obtain your FAA Commercial Pilot certificate. If you already have a degree in another field but are interested in learning the material covered in the ground school classes for private pilot, instrument, and commercial as well as meteorology, then the Career Pilot Certificate may be a good option for you. You will need to follow the general enrollment process for GTCC, found here. During the advising process you will have the opportunity to indicate your desire to study within this curriculum. Your advisor will help you sign up for the specific courses you need. Advising can be done with any full-time faculty member in the Aviation Management/Career Pilot department. Financial Aid, including Pell Grants, student loans, and scholarships can be used to help offset the costs of flight training. If you are at least a high school graduate or are enrolled in the Career and College Promise program, you can qualify for the Aviation Management or Career Pilot programs. If you are a current high school student and would like to find out more about the Career and College Promise program, please contact Linda Whitlow at lswhitlow@gtcc.edu You will need to satisfy placement requirements in reading and math in order to register for courses in the program. You will need to test out of DRE 098 in reading and at least DMA 050 in math to start courses in the AER programs. To meet math requirements for the Career Pilot and Aviation Management degrees, you will need to test out of DMA 080. Prior flight training is not required to start the degree or certificate programs. 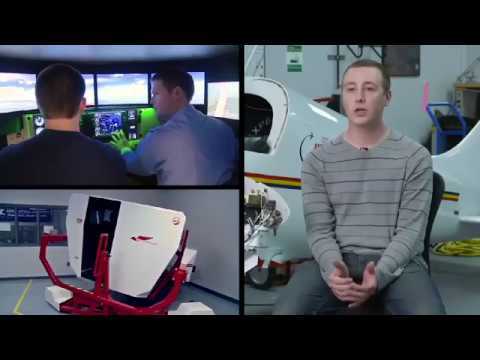 Is flight training a required part of the degree? Flight training is required for the Career Pilot degree but not the Aviation Management degree. In order to graduate with the Career Pilot degree, you must obtain your FAA Commercial Pilot certificate. Depending on how and where you do your flight training, it requires 190-250 flight hours. Flight training is conducted with a third-party flight training provider. This could be an independent flight instructor or a flight school. What is the cost for flight training? This depends on where you choose to do your flight training and which type of aircraft you fly. Flight training is charged by the hour. Most training aircraft costs are between $120-$170/hour. On top of that cost, you may also be flying with a flight instructor, and flight instructors usually charge between $30-$50/hour. Flight training costs to obtain your commercial certificate will average about $40,000. Flight training costs are in addition to tuition and fees charged by the college for the degree classes. The cost for tuition and books for the associate’s degree at GTCC will total approximately $7,500 - $8,000. Can I use my GI Bill benefits? GI Bill benefits can be used for flight training but cannot be used toward a Private Pilot certificate. These flight training benefits are paid directly to the flight school where you choose to do your training. The flight school must be Part 141 certificated and must be approved by the VA in order to use your GI Bill benefits there. GI Bill benefits can be used for classes in the Aviation Management program. Are simulators available for use in flight training? We have three: Redbird, FMX, and full-motion AATDs. These can be scheduled with a GTCC flight instructor. These are scheduled through continuing education and are available to curriculum students and individuals outside of GTCC who want to purchase simulator time to train for a new certificate, improve proficiency, or meet currency requirements. Does GTCC have transfer agreements with any 4-year universities? GTCC does have a comprehensive articulation agreement with North Carolina public universities, but the aviation programs also have specific articulation agreements with Embry Riddle Aeronautical University (Greensboro Campus) and Elizabeth City State University in North Carolina. Can I take a tour to learn more about the facilities and programs? What is the outlook for employment opportunities?